Son of a railroad employee. In 1903-1904 he had acting lessons in Vienna and in 1905 he debuted as an actor. He held engagements in Dortmund, Nürnberg, Vianna and New York. In 1912 and 1913 he staged several plays at the Deutschen Volkstheater in New York. On his way back to Germany he was in France when the First World War broke out and he was interned at Brest until 1919. In 1920 he was engaged at the Neuen Wiener Bühne and in he directed his first movie, "Der Schatz". In 1924 he married Gertrude Hennings. They had two sons. In "Die freudlose Gasse" (1925) with Greta Garbo and Asta Nielsen he painted a strong contrast between poverty and wealth. This was his first succes and he made many more movies during the 1920s, among them was "Die Büchse der Pandora" (1929). In 1930 he made his first talkie, "Westfront 1918". In 1933 he left Germany after the nazis came to power, but in 1939 he returned. During the war he directed "Kömödianten" (1941) and "Paracelsus" (1943). After the war his movies were less succesful. In 1953 he directed a number of opera productions in Italy. In 1956 he made his last two movies and then he withdrew from public life. He died in 1967. 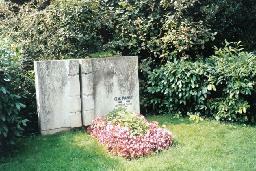 The grave of G.W. Pabst at the Zentralfiedhof, Vienna.